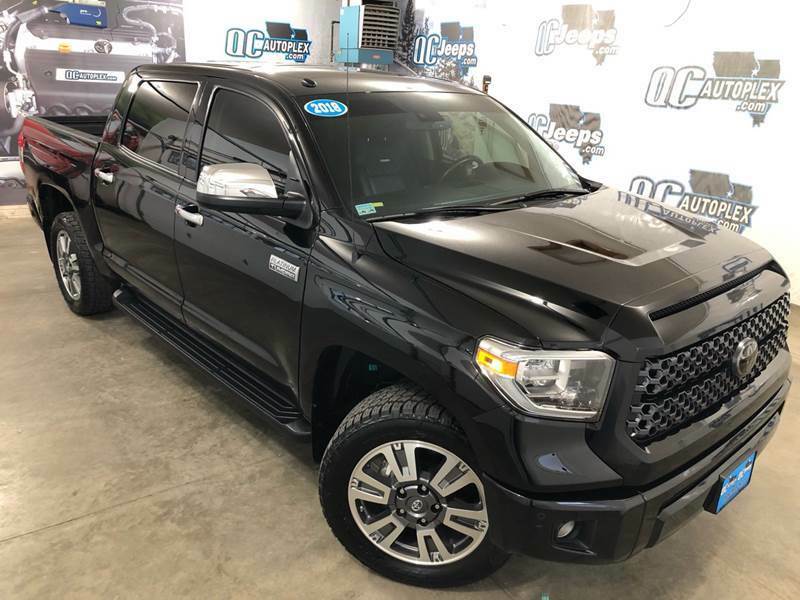 2018 Toyota Tundra Crew Max Platinium 4x4 (TOP OF THE LINE) 13K Miles Color: Black Doors: 4 Transmission: Automatic Engine: 5.7 Liter V8 Reverse Camera Navigation Tow Package Trailer Brake Power Folding Mirrors Bedliner Brand New Nito Teragrappler Tires Sunroof Heated Leather Bluetooth Parking Sensors Lane Departure Warning System Blind Spot Monitor Adaptive cruise Control Brake Mitigation System Comes With a 6 Month/6,000 Mile Warranty included from us! For walk around video and virtual test drive, COPY and PASTE the following link: https://youtu.be/pfCM1DbLcSU $40,950 with financing available as low as 3.74% please call or text 309-945-6227 WWW.QCAUTOPLEX.COM WWW.FACEBOOK.COM/QCAUTOPLEX ~110 S 9th ave Eldridge, IOWA 52748~ **309-945-6227** OPEN 6 DAYS A WEEK 9AM-6PM MON-SAT or by appointment anytime after hours Check the website for even more WWW.QCAUTOPLEX.COM WWW.FACEBOOK.COM/QCAUTOPLEX WWW.QCAUTOPLEX.COM (309)945-6227 We here at QCAUTOPLEX.COM specialize in bringing you great, affordable, economic cars. We are not your average used car dealer...We take pride in each and every car we sell & We specialize in Hondas, Toyotas, and specifically Jeep Wranglers. There is over 25 years of combined Honda, Toyota & Jeep Experience here at QCAUTOPLEX.COM. We strive to please and hope to have a ongoing relationship with each customer. Word of mouth is our biggest advertisement! We appreciate referred customers; AND we award those who referred them! We hope to help you in your search for a reliable vehicle! Feel free to browse the site for our current inventory or give us a call at 309-945-6227. Visit WWW.QCAUTOPLEX.COM for quality used Honda and Jeep Wrangler sales. Don`t live close to Eldridge, IA? We ship nationwide! We are also worth the drive near or far. With the largest selection of pre-owned Hondas, Toyotas, and Jeep Wranglers; QCAUTOPLEX.COM is located just 5 minutes North of the Quad Cities. Contact us at 309-945-6227 QCAUTOPLEX.COM 110 S 9th Ave Eldridge, IA The front windshield is in excellent condition. The paint is in great shape and condition. No dings are visible on this vehicle. The interior was well maintained and is extra clean. The exterior was well maintained and is extra clean. The engine is functioning properly and has no issues. The transmission shifts very smoothly. The brakes are in great condition. The battery is in excellent condition. The car was previously owned by a non smoker. A full size spare is included with this vehicle. This vehicle comes with a spare key.